If you love Christmas lights, Pittsburgh is a fantastic destination. 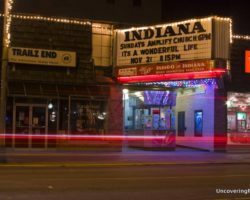 Throughout the downtown area, there are many fantastic spots to enjoy the beauty of the holiday season. Beginning on Light Up Night on the Friday before Thanksgiving and continuing through New Year’s Day, there are many great opportunities to enjoy beautiful displays of Christmas Lights in Pittsburgh. 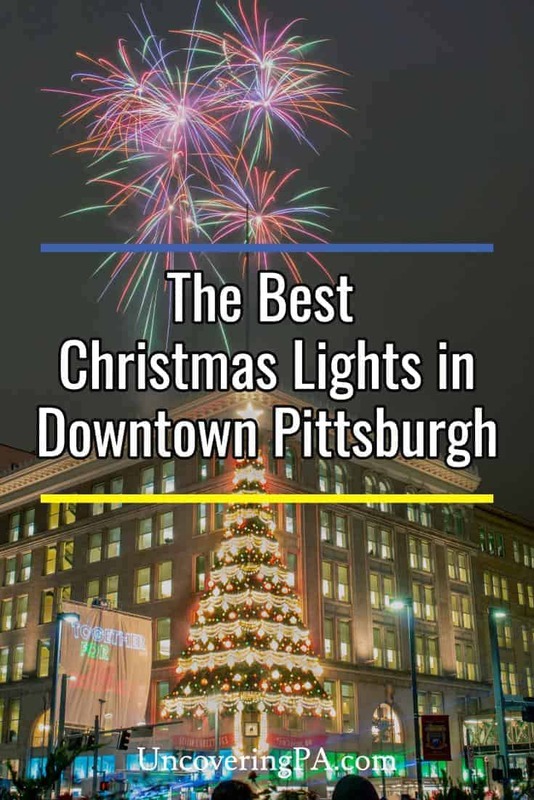 Here are a few of my favorite spots in and around downtown Pittsburgh to enjoy great lights and decorations during the holiday season. Enjoy the Christmas tree and ice skating rink in PPG Place. 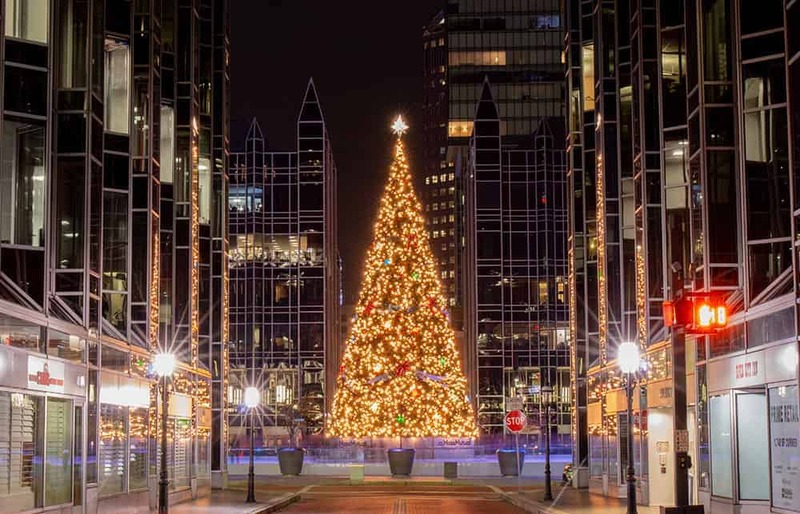 In the center of PPG Place, a brilliant black glass structure and one of the most recognizable buildings in the city, is a popular public square that is filled with festive charm. 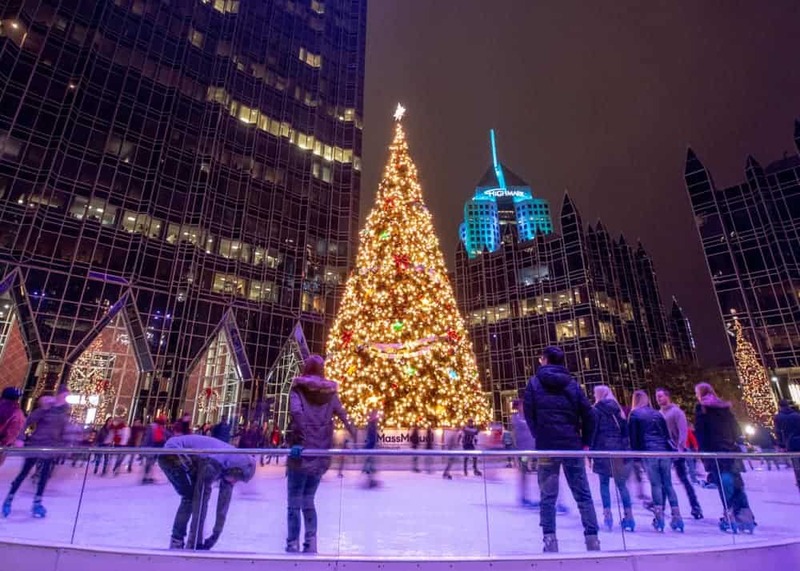 The highlight of PPG Place’s Christmas celebration is the 65-foot Christmas tree in the center of a beautiful ice skating rink. Like most city skating rinks, it’s on the smaller side and often crowded, but if you want to go for a festive skate, this is the place to do it. Of course, you can also stand on the sidelines and simply enjoy watching the skaters go by and the twinkling lights of the PPG Christmas tree in downtown Pittsburgh. 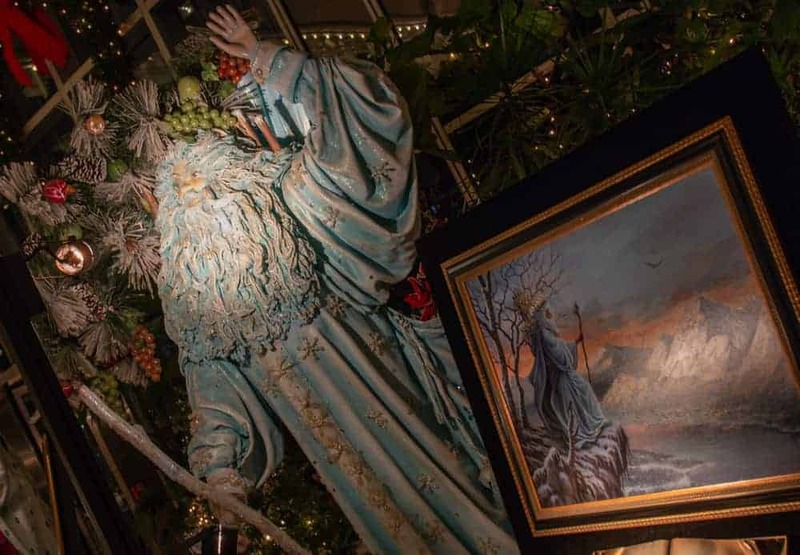 Wintergarden inside the PPG Place is a great spot for holiday cheer and history. Another great spot in PPG Place is the fantastic Wintergarden. Located on the ground floor of the building, this interior space is decorated with dozens (if not hundreds) of handmade gingerbread houses. These gingerbread houses are designed by both organizations and individual families and on display throughout the season. It’s fun to browse the houses and look for the many different scenes that are depicted. In addition to the gingerbread houses, Wintergarden is also home to the Spirits of Giving Around the World exhibition. 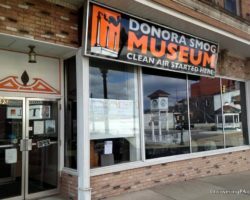 This features life-size recreations of Santa Claus-esque figures from around the world. Each display includes information about a traditional character from a culture and a brief description of them. They are then depicted in both a painting and a life-size figure. These two displays make Wintergarden not only a great place to experience the holidays in downtown Pittsburgh, but also a nice place to warm up on a chilly evening. 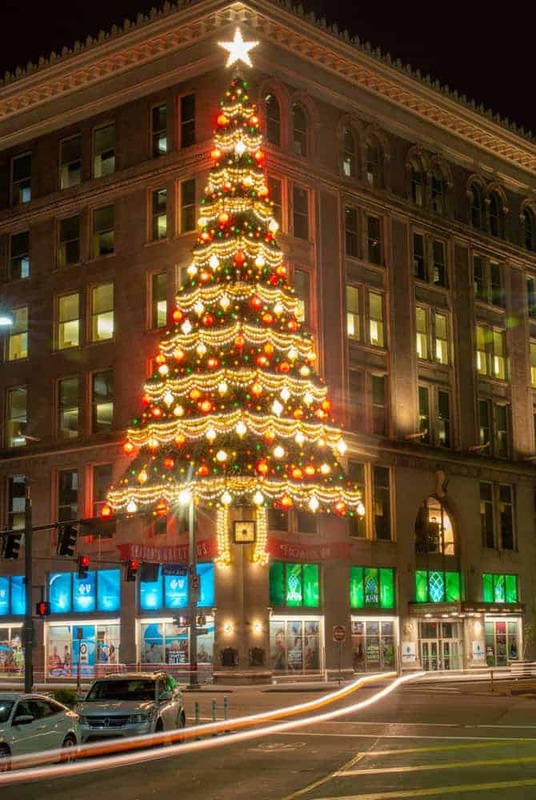 The Unity Tree on the Horne’s Building is a 60-year tradition in Pittsburgh. The Unity Tree, better known to locals as the Horne’s Tree because it graces the former Horne’s Department Store Building, might be my favorite spot for Christmas lights in Pittsburgh. This unique tree adorns the corner of the Horne Building at the intersection of Stanwix Street and Penn Avenue in the heart of downtown Pittsburgh. This 6-story tree covers both sides of the building’s corner, creating one of the most interesting holiday displays in Pennsylvania. If you have a chance to be in Pittsburgh for Light Up Night, I highly recommend checking out the tree lighting here because it’s the only tree that’s lit with its own fireworks show. 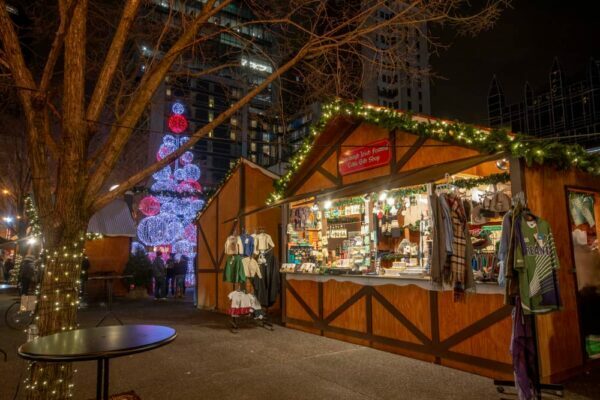 If you’re looking for Christmas gifts, there are few better places to visit in Pittsburgh than the Holiday Market in Market Square. 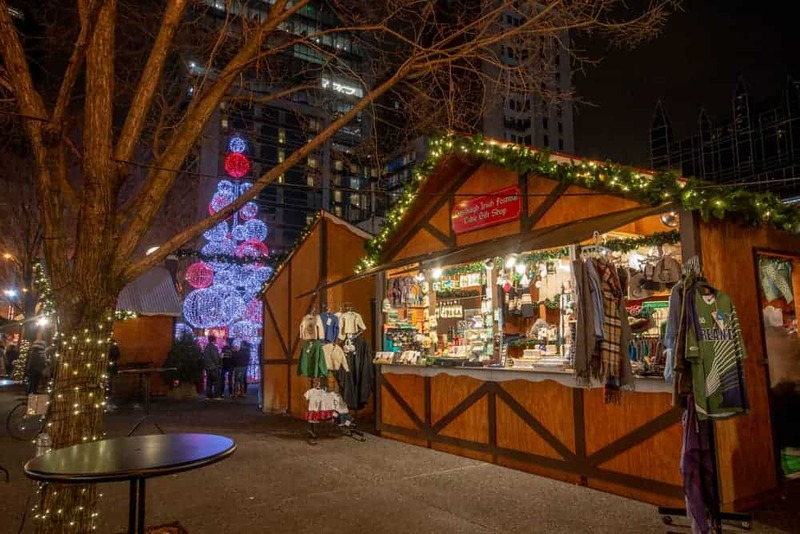 Featuring dozens of vendors who rotate out throughout the season, this German-style Christmas market offers everything from delicious foods to authentic European Christmas decorations and handmade gifts. Held from Light Up Night through the weekend before Christmas, the Holiday Market also features live entertainment, photos with Santa, and a unique Christmas tree. The City-County Building always looks festive during the holiday season. Continuing a more than 100-year tradition, the City-County Building lights a beautiful Christmas tree in downtown Pittsburgh. At approximately 60 feet in height, the tree here is always one of the largest in the city. 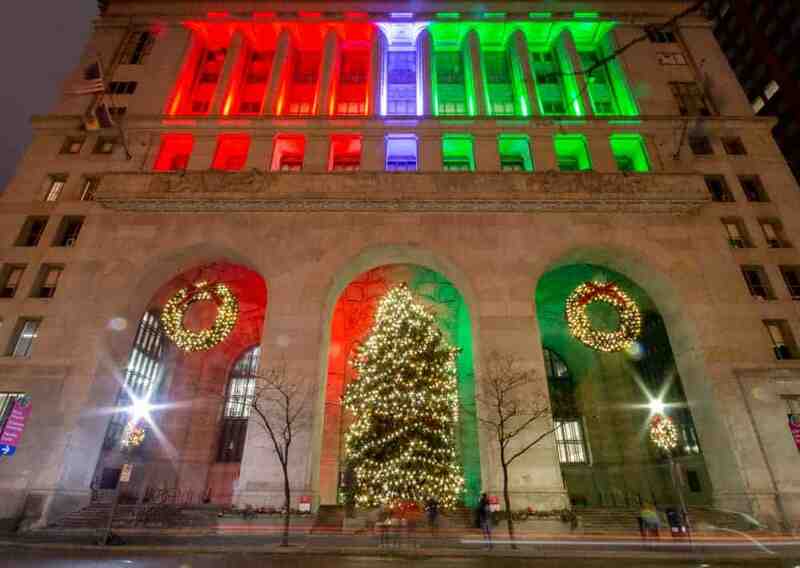 In addition to the tree, the building is adorned with festive green and red Christmas lights making this one of the most festive buildings in downtown Pittsburgh. The Pittsburgh Crèche is a large nativity scene located in the plaza below the U.S. Steel Tower. 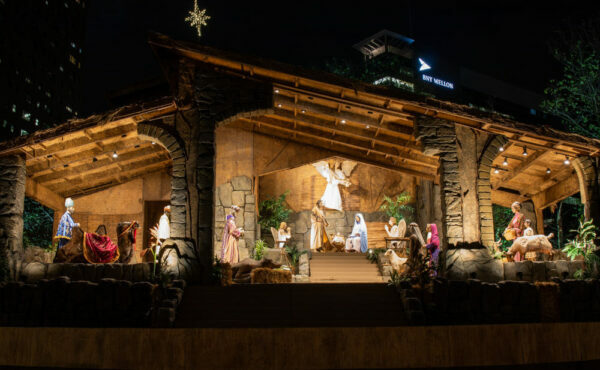 On display every year since 1999, the Pittsburgh Crèche is the only authorized replica of the nativity scene at St. Peter’s Cathedral in Vatican City. This is likely the largest nativity scene you’ve ever seen at 64 feet across and 42 feet in height. All told, there are 20 large figurines in the Crèche including Mary, Joseph, and baby Jesus. 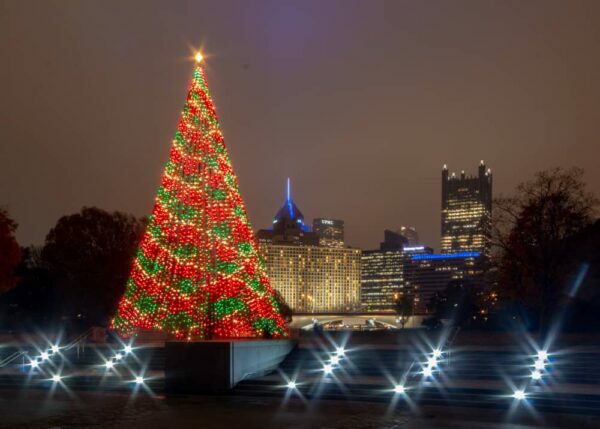 The Christmas tree in Point State Park is not only beautiful, but also offer great views of the city. The Christmas tree in Point State Park might be the most photographed holiday lights in Pittsburgh. That’s because this tree is visible in nearly any photograph taken from popular spots like Mount Washington and the West End Overlook. This beautiful tree isn’t a tree at all, but rather a collection of string lights around a metal pole. Nevertheless, this festive decoration is one of the most beautiful spots in Pittsburgh during the holiday season. If you’re looking for a festive drink, there are four holiday pop-up bars in downtown Pittsburgh. If you want to get a drink with a bit of festive charm, you are in luck. 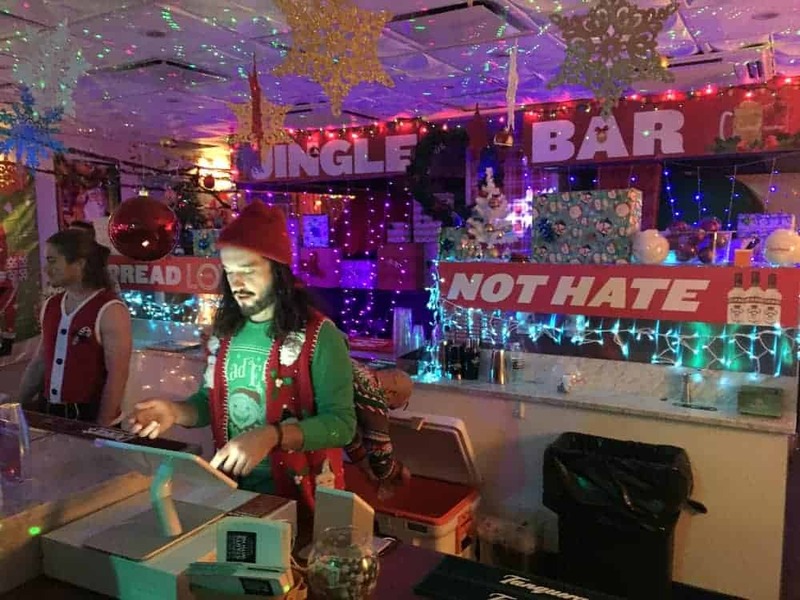 Downtown Pittsburgh is home to four Christmas-themed pop up bars. While the most popular of these is undoubtably Miracle on Liberty, it’s always packed, so instead, I decided to check out Jingle Bar, which is new in 2018. Walking into Jingle Bar feels like walking into a tackily decorate Christmas present (in a positive way, of course). Decorations are heavily scattered throughout the bar, and all the people working there are adorned in festive attire. The drinks here are on the pricy side, and while they have festive names and ingredients, they are somewhat underwhelming. Nevertheless, if you are looking for a festive drink in Pittsburgh, don’t miss these pop-up bars as they offer a fun and unique atmosphere that’s worth experiencing. 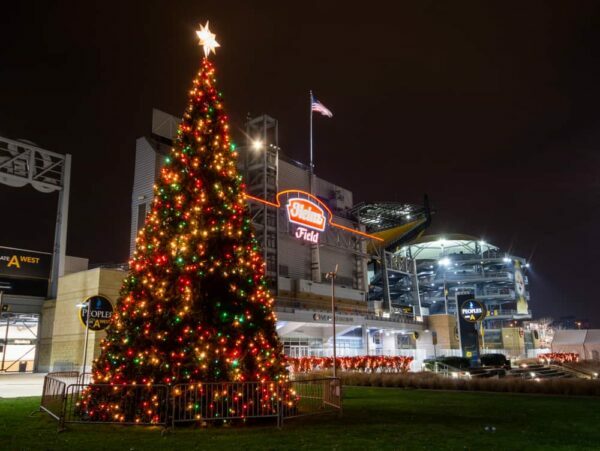 The Christmas tree outside Heinz Field is worth the trip over to the North Shore from downtown Pittsburgh. While it’s on the North Shore and not in downtown, the tree outside of Heinz Field is easily one of the most beautiful places to see Christmas lights in Pittsburgh. This tall tree is easily visible from North Shore Drive, or you can walk up for a better look. Truthfully, the entirety of Heinz Field is quite beautifully adorned with lights and is worth checking out during the holiday season in Pittsburgh. 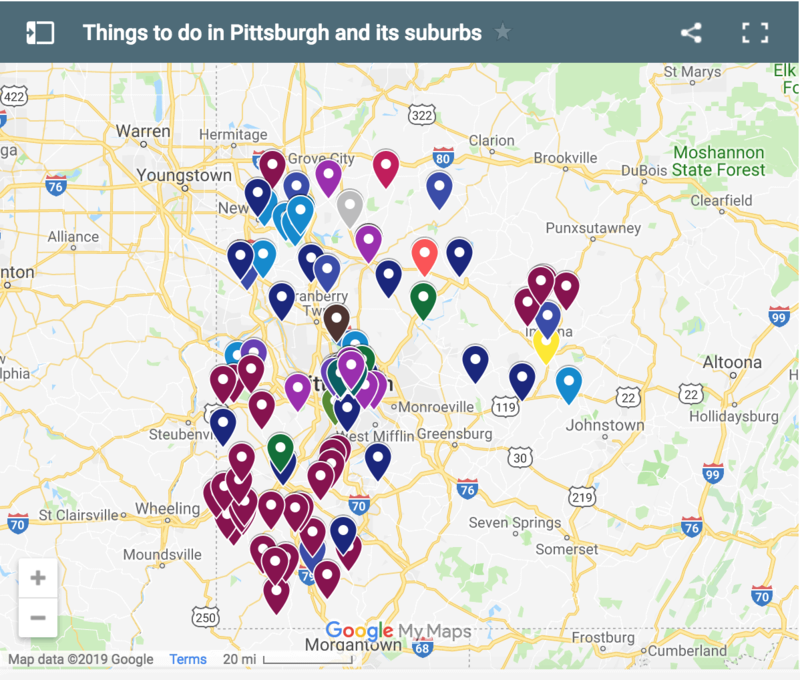 What’s your favorite spot for Christmas lights in Pittsburgh? Let us know in the comments section below. 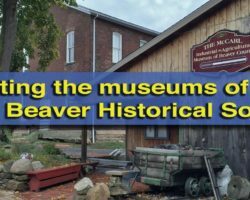 Looking for more great things to do during Christmas in Pennsylvania? 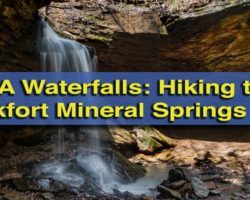 Check our our top picks in Philadelphia, Bethlehem, Lancaster, and Harrisburg. Or take the short drive up to Hermitage for Kraynak’s Christmas.